Germans from Russia Heritage Collection, North Dakota State University Libraries, Fargo, North Dakota, 2012, 127 pages, Softcover. 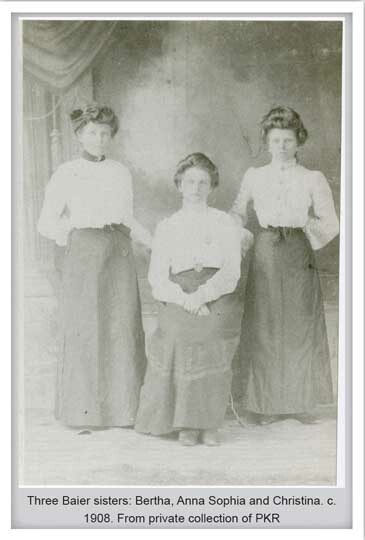 The Farm at Pony Gulch tells the story of Michael and Anna Sophia (Witt) Baier, who came to America in 1883 from Arzis, Bessarabia. As German-Russian immigrants, they had become disillusioned with the promises made to them by Catherine the Great and her grandson, Czar Alexander I. 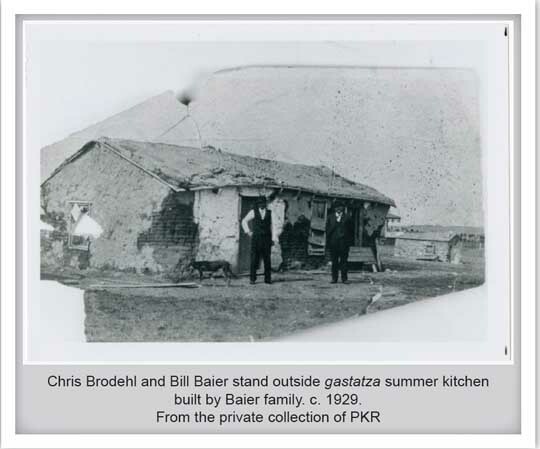 The Baiers first settled at Scotland, S.D., and then, in 1896, homesteaded in Pony Gulch Township near Harvey, N.D.
For the most part, "The Farm at Pony Gulch" is the memoirs of their grandson, Eddie Knalson, who helped on the Baier farm when he was young. He included much oral history told to him by his Aunt Bertha. Patsy Knalson Ramberg, Eddie’s daughter, adds insight into the family and areas where they lived. Knalson tells how the family with 10 children moved from Scotland to Pony Gulch, which was a six-week walk, with four wagons full of "chickens, pigs and whatnot." 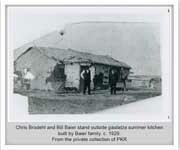 They built a sod house, and later a gastatza (Batsa) summer kitchen, a mud and brick construction unique to Germans from Russia. Of interest is the oral history from Aunt Bertha. 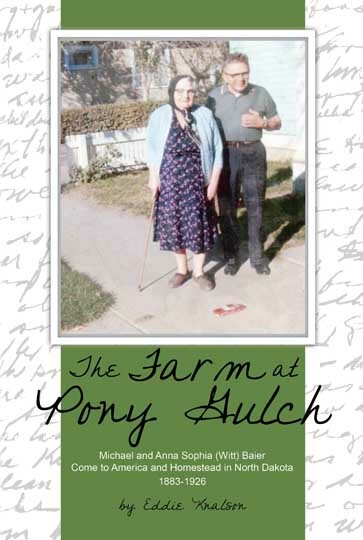 Recorded in 1970, she tells how the Pony Gulch site was chosen, how the family lived in the sod house with its big Russian oven and gives her remedy for frozen fingers in the winter. Knalson (1909-1995) wrote the tale of Pony Gulch in his retirement. After her retirement, Patsy Knalson Ramberg decided it was time to share his story with a wider audience, and The Farm at Pony Gulch is the result.